Also known as a Time Series Spiral. 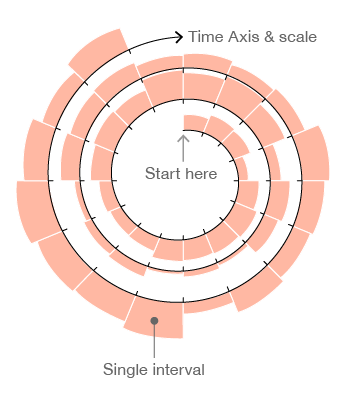 This type of visualisation plots time-based data along an Archimedean spiral. The graph begins at the centre of a spiral and then progresses outwards. Spiral Plots are versatile and can use bars, lines or points to be displayed along the spiral path. Spiral Plots are ideal for showing large data sets, usually to show trends over a large time period. This makes Spiral Plots great for displaying periodic patterns. Colour can be assigned to each period to break them up and to allow some comparison between each period. So for example, if we were to show data over a year, we could assign a colour for each month on the graph.